The interest which recent events have attracted to the community in Deseret or Utah, will render interesting a more par­ticular survey of its origin, progress and condition. 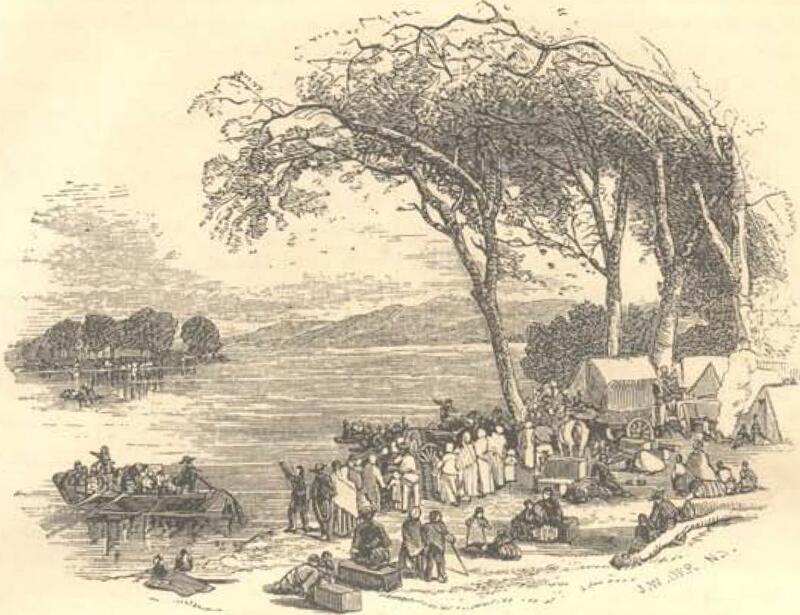 In 1825 there lived near the village of Palmyra in New-York, a family of small farmers of the name of Smith. They were of bad repute in the neighborhood, notorious for being continually in debt, and heedless of their business engage­ments. The eldest son, Joseph, says one of his friends, "could read without much difficulty, wrote a very imperfect hand, and had a very limited understanding of the elementary rules of arithmetic." As­sociated in some degree with Sidney Rigdon, who comes before us in the first place as a journeyman printer, he was the founder of the new faith. The early his­ tory of the conspiracy of these worthies is imperfectly known; but it is evident that Rigdon must have been in Smith's con­fidence from the first. Rigdon, indeed, probably had more to do with the matter than even Smith; but it was the latter who was first put conspicuously forward, and who managed to retain the preemi­nence. The account of the pretended revelation, as given by Smith, is as fol­lows: He all at once found himself laboring in a state of great darkness and wretch­edness of mind - was bewildered among the conflicting doctrines of Christians, and could find no comfort or rest for his soul. In this state, he resorted to earnest prayer, kneeling in the woods and fields, and after long perseverance was answered by the appearance of a bright light in heaven, which gradually descended until it enveloped the worshiper, who found himself standing face to face with two supernatural beings. Of these he inquired which was the true religion? The reply was that all existing religions were erro­neous, but that the pure doctrine and crown­ing dispensation of Christianity should at a future period be miraculously revealed to himself. Several similar visitations en­sued, and at length he was informed that the North American Indians were a rem­nant of Israel; that when they first en­tered America they were a powerful and enlightened people; that their priests and rulers kept the records of their history and doctrines; but that, having fallen off from the true worship, the great body of the nation were supernaturally destroyed – not, however, until a priest and prophet, named Mormon, had, by heavenly direc­tion, drawn up an abstract of their records and religious opinions. He was told that this still existed buried in the earth, and that he was selected as the instrument for its recovery and manifestation to all na­tions. The record, it was said, contained many prophecies as to these latter (lays, and instructions for the gathering of the saints into a temporal and spiritual king­dom, preparatory to the second coming of the Messiah, which was at hand. After several very similar visions, the spot in which the book lay buried was disclosed. Smith went to it, and after digging dis­covered a sort of box, formed of upright and horizontal flags, within which lay a number of plates resembling gold, and of the thickness of common tin. These were bound together by a wire, and were en­graved with Egyptian characters. By the side of them lay two transparent stones, called by the ancients, "Urim and Thum­mim," set in "the two rims of a bow." These stones were divining crystals; and the angels informed Smith, that by using them he would be enabled to decipher the characters on the plates. What ultimately became of the plates - if such things ex­isted at all - does not appear. They were said to have been seen and handled by eleven witnesses. With the exception of three persons, these witnesses were either members of Smith's family, or of a neigh­boring family of the name of Whitmer. The Smiths, of course, give suspicious testimony. The Whitmer’s have disap­peared, and no one knows anything about them. Another witness, Oliver Cowdrey, was afterward an amanuensis to Joseph; and another, Martin Harris, was long a conspicuous disciple. There is some con­fusion, however, about this person. Al­though he signs his name as a witness who has seen and handled the plates, he assured Professor Anthon that he never had seen them, that "he was not suffi­ciently pure of heart;" and that Joseph refused to show him the plates, but gave him instead a transcript on paper of the characters engraved on them. It is diffi­cult to trace the early advances of the imposture. Everything is vague and uncertain. We have no dates, and only the statements of the prophet and his friends. Meantime, Smith must have worked successfully on the feeble and superstitious mind of Martin Harris. This man, as we have just said, received from him a writ­ten transcript of the mysterious characters, and conveyed it to Professor Anthon, a competent philological authority. Dr. An­thon's account of the interview is one of the most important parts of the entire history. Harris told him he had not seen the plates, but that he intended to sell his farm and give the proceeds to enable Smith to publish a translation of them. This statement, with what follows, shows that Smith's original intention, quoad the al­leged plates, was to use them as a means for swindling Harris. The Mormons have published accounts of Professor Anthon's judgment on the paper submitted to him, which he himself states to be "perfectly false." The Mormon version of the inter­view represents Dr. Anthon "as having been unable to decipher the characters correctly, but as having presumed that, if the original records could he brought, he could assist in translating them." On this statement being made, Dr. Anthon described the document submitted to him as having been a sort of potpourri of ancient marks and alphabets. "It had evidently been prepared by some person who had before him a book containing various alpha­bets: Greek and Hebrew letters, crosses and flourishes, Roman letters, inverted or placed sideways, were arranged in perpendicular columns, and the whole ended in a rude delineation of a circle, divided into various compartments, decked with numerous strange marks, and evidently copied after the Mexican Calendar given by Humboldt, but copied in such a way as not to betray the source whence it was derived." This account disposes of the statement that the characters were Egyp­tian; while the very jumble of the signs of different nations, languages, and ages, proves that the impostor was deficient both in tact and knowledge. The scheme seems to have been, at all events, in petto when Smith communicated with Harris; but a satisfactory clue to the fabrication is lost in our ignorance of the time and circumstances under which Smith and Rigdon came together. It must have been subsequent to that event that the "trans­lation," by means of the magic Urim and Thummim, was begun. This work Smith is represented as having labored at steadily, assisted by Oliver Cowdrey, until a vol­ume was produced containing as much matter as the Old Testament, written in the Biblical style, and containing, as Smith said the angel had informed him, a history of the lost tribes in their pilgrimage to and settlement in America, with copious doc­trinal and prophetic commentaries and revelations. "Since the Book of Mormon, or Golden Bible, (as it was originally called) has excited much attention, and is deemed by a certain new sect of equal authority with the sacred Scriptures, I think it a duty to the public to state what I know of its origin … Solomon Spaulding, to whom I was married in early life, was a gradu­ate of Dartmouth College, and was distinguished for a lively imagination, and great fondness for history. At the time of our marriage, he resided in Cherry Valley, New York. From this place we removed to New Salem, Ashtabula County, Ohio, sometimes called Conneaut, as it is situated on Conneaut Creek. Shortly after our removal to this place, his health failed, and he was laid aside from active labors. In the town of New Salem there are numerous mounds and forts, supposed by many to be the dilapi­dated dwellings and fortifications of a race now extinct. These relics arrest the attention of new settlers, and become objects of research for the curious. Numerous implements were found and other articles evincing skill in the arts. Mr. Spaulding being an educated man took a lively interest in these developments of an­tiquity; and in order to beguile the hours of retirement, and furnish employment for his mind, he conceived the idea of giving an historical sketch of the long-lost race. Their an­tiquity led him to adopt the most ancient style, and he imitated the Old Testament as nearly as possible. His sole object in writing this imaginary history was to amuse himself and his neighbors. This was about the year 1812. Hull's surrender at Detroit occurred near the same time, and I recollect the date well from that circumstance. As he progressed in his narrative, the neighbors would come in from time to time to hear portions read, and a great interest, in the work was excited among them. It claimed to have been written by one of the lost nation, and to have been recovered from the earth; and he gave it the title of 'The Manuscript Found.' The neighbors would often inquire how Mr. Spaulding advanced in decipher­ing the manuscript; and when he had a suffi­cient portion prepared, he would inform them, and they would assemble to hear it read. He was enabled, from his acquaintance with the classics and ancient history, to introduce many singular names, which were particularly noticed by the people, and could be easily recognized by them. Mr. Solomon Spaulding had a brother, Mr. John Spaulding, residing in the place at the time, who was perfectly familiar with the work, and repeatedly heard the whole of it. From New Salem we removed to Pittsburgh, in Penn­sylvania. Here Mr. Spaulding found a friend and acquaintance, in the person of Mr. Patter­son, and editor of a newspaper. He exhibited his manuscript to Mr. Patterson, who was much pleased with it, and borrowed it for perusal. He retained it a long time, and informed Mr. Spaulding that if he would make out a title-page and preface, he would publish it, and it might, be a source of profit. This Mr. Spauld­ing refused to do. Sidney Rigdon, who has figured so largely in the history of the Mormons, was at that time connected with the printing-office of Mr. Patterson, as is well known in that region, and, as Higdon himself has frequently stated, became acquainted with Mr. Spaulding's manuscript, and copied it. It was a matter of notoriety and interest to all connected with the printing establishment. At length the manuscript was returned to its author, and soon after we removed to Amity, Washington County, where Mr. Spaulding died, in 1815. The manu­script then fell into my hands, and was care­fully preserved. It has frequently been exam­ined by my daughter, Mrs. M'Kenstry, of Mun­son, Massachusetts, with whom I now reside, and by other friends. After the Book of Mormon came out, a copy of It was taken to New-Salem, the place of Mr. Spaulding's former residence, and the very place where the ‘Manuscript Found’ was written. A woman appointed a meeting there; and in the meeting read copious extracts from the Book of Mermen. The his­torical part was known by all the older inhab­itants as the identical work of Mr. Spaulding, in which they had all been so deeply interested years before. Mr. John Spaulding was present, and recognized perfectly the production of his brother. He was amazed and afflicted that it should have been perverted to so wicked a pur­pose. His grief found vent in tears, and he arose on the spot, and expressed to the meeting his sorrow that the writings of his deceased brother should be used for a purpose so vile and shocking. The excitement in New Salem be­came so great, that the inhabitants had a meet­ing, and deputed Dr. Philastus Hurlbut, one of their number, to repair to this place, and to obtain from toe the original manuscript of Mr. Spaulding, for the purpose of comparing it with the Mormon Bible - to satisfy their own minds and to prevent their friends from embracing an error so delusive. This was in the year 1834. Dr. Hurlbut brought with him an introduction and request for the manuscript, which was signed by Messrs. Henry, Lake, Aaron, Wright, and others, with all of whom I was acquainted, as they were my neighbors when I resided at New-Salem. I am sure that nothing would grieve my husband more, were he living, than the use which has been made of his work. The air of antiquity which was thrown about the compo­sition doubtless suggested the idea of converting it to the purposes of delusion. Thus, an his­torical romance, with the addition of a few pious expressions, and extracts from the sacred Scriptures, has been construed into a new Bible, and palmed off upon a company of poor deluded fanatics as divine." Similar evidence as to the Spaulding MS. was given by several private friends, and by the writer's brother, all of whom were familiar with its contents. The facts thus graphically detailed have of course been denied, but have never been dis­proved. Indeed, without them; it is impossible to explain the hold which Rigdon always possessed on the Prophet; for he was a poor creature, without education and without talents. At one time—a crit­ical moment in the history of the new Church—a quarrel arose between the ac­complices; but it ended in Smith's re­ceiving a "revelation," in which Rigdon was raised by divine command to be equal with himself, having plenary power given to him to bind and loose both on earth and in heaven. The remaining history of the Mormons is eminently interesting. Ignorant and superstitious as have been the chief part of the disciples, and atrocious as have been the tricks of the knaves who have led them on amid all the varieties of their good and evil fortune, there have occa­sionally been displayed among them an enthusiasm and bravery of endurance that demand admiration. 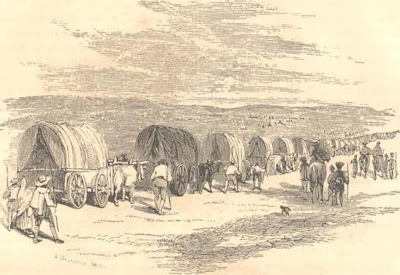 Nearly from the be­ginning the leaders of the sect seem to have contemplated settling in the thinly populated regions of the western states, where lands were to be purchased for low prices; and after a short residence at Kirk­land, in Ohio, they determined to found a New Jerusalem in Missouri. 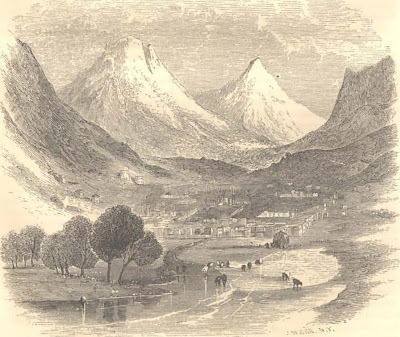 The interests of the town were confided to suit­able officers, and Smith spent his time in traveling through the country and preach­ing, until the real or pretended immorali­ties of the sect led to such discontents that in 1839 they were forcibly and law­lessly expelled from the State. We are inclined to believe that they were not only treated with remarkable severity, but that there was no reason whatever to justify an interference in their affairs. From Missouri the saints proceeded to Illinois, and on the 6th of April, 1841, with imposing ceremonies, laid at their new city of Nauvoo the corner-stone of the Temple, an immense edifice, without any architectural order or attraction, which in a few months was celebrated every­where as not inferior in size and magnificence to that built by Solomon in Jerusalem. It was of white limestone, one hundred and twenty-eight feet long, eighty-three feet wide, and sixty feet high. Its style will be seen in the engraving. 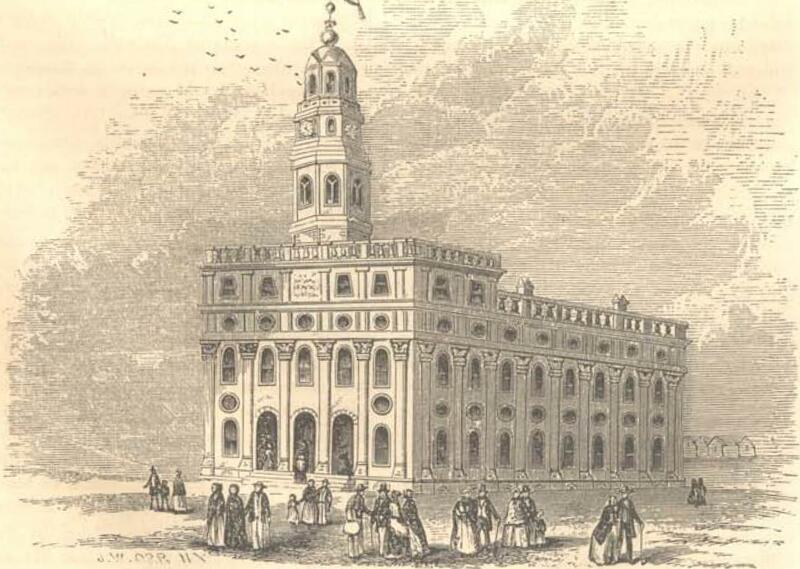 This building was destroyed by fire on the 19th of November, 1848. Nauvoo is delightfully situated in the midst of a fertile district, and a careful inquirer will not be apt to deny that it became the home of a more industrious, frugal, and generally moral society, than occupied any other town in the State. 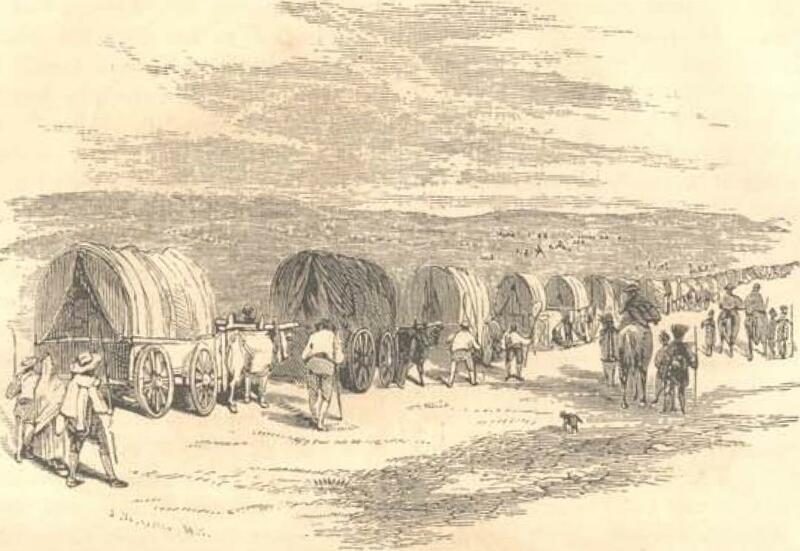 Whatever charges were preferred against Smith and his dis­ciples, to justify the outrages to which they were subjected, the history of their expulsion from Nauvoo is simply a series of illustrations of the fact that the ruffian population of the neighboring country set on foot a vast scheme of robbery in order to obtain the lands and improvements of the Mormons without paying for them. We have not room for a particular state­ment of the discontents and conspiracies which grew up in the city, nor for any detail of the aggressions from without. On the 27th of June, 1844, Joseph and Hiram Smith were murdered, while under the especial protection of the authorities of the State. The death of their leaders now threw the saints into the utmost confusion. Va­rious pretenders to the supreme power and influence at once appeared. After much dissension, the party of Brigham Young triumphed over that of Sidney Rigdon; the sect were reorganized, and for some time were permitted quietly to pros­ecute their plans at Nauvoo. 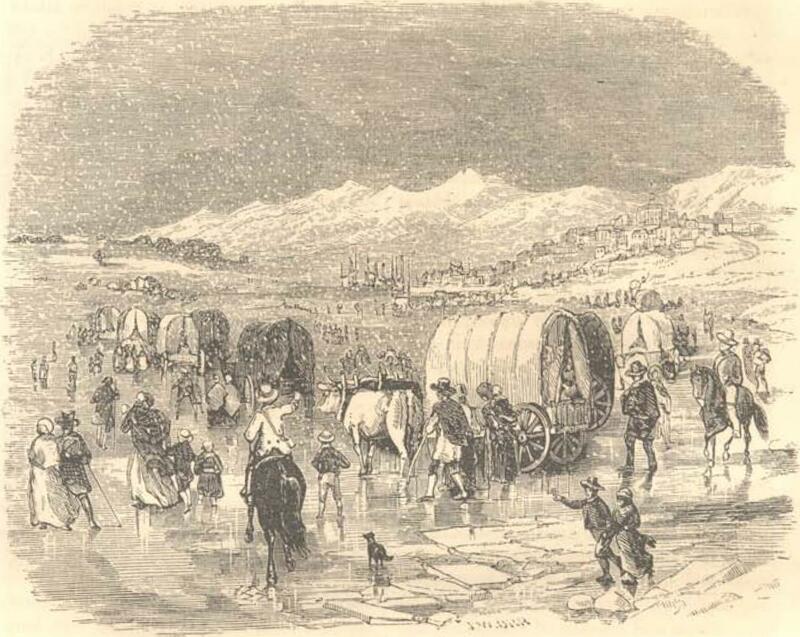 But early in 1846 they were driven out of their city, and compelled in midwinter to seek a new home beyond the farthest borders of civili­zation. The first companies, embracing sixteen hundred persons, crossed the Mis­sissippi on the ad of February, 1846, and similar detachments continued to leave until July and August, traveling by ox-teams toward California, then almost un­known, and quite unpeopled by the Anglo-Saxon race. Their enemies asserted that the intention of the Saints was to excite the Indians against the government, and that they would return to take vengeance on the whites for the indignities they had suffered. Nothing appears to have been further from their intentions. Their sole object was to plant their Church in some fertile and hitherto undiscovered spot, where they might be unmolested by any opposing sect. The war against Mexico was then raging, and, to test the loyalty of the Mormons, it was suggested that a demand should be made on them to raise five hundred men for the service of the country. They consented, and that num­ber of their best men enrolled themselves under General Kearney, and marched two thousand four hundred miles with the ar­mies of the United States. At the con­clusion of the war they were disbanded in Upper California. They allege that it was one of this band who, in working at a mill, first discovered the golden treasures of California; and they are said to have amassed large quantities of gold before the secret was made generally known to the "Gentiles." But faith was not kept with the Mormons who remained in Nauvoo. 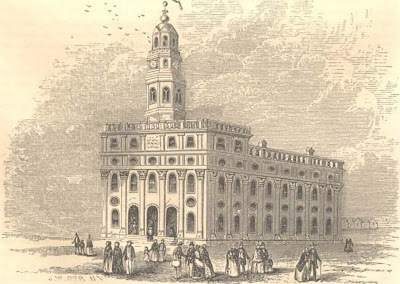 Although they had agreed to leave in de­tachments, as rapidly as practicable, they were not allowed necessary time to dis­pose of their property; and in September, 1846, the city was besieged by their ene­mies upon the pretense that they did not intend to fulfill the stipulations made with the people and authorities of Illinois. After a three days' bombardment, the last remnant was finally driven out. "Deseret is emphatically a new country; new in its own characteristic features, newer still in its bringing together within its limits the most inconsistent peculiarities of other countries. I cannot aptly compare it to any. Descend from the mountains, where you have the scenery and climate of Switzerland, to seek the sky of your choice among the many climates of Italy, and you may find welling out of the same hills the freezing springs of Mexico and the hot springs of Iceland, both together cours­ing their way to the Salt Sea of Palestine, in the plain below. The pages of Malte Brun pro­vide me with a less truthful parallel to it than those which describe the Happy Valley of Ras­selas, or the continent of Ballibarbi." The history of the Mormons has ever since been an unbroken record of pros­perity. It has looked as though the ele­ments of fortune, obedient to a law of natural reaction, were struggling to com­pensate their undue share of suffering. They may be pardoned for deeming it miraculous. But, in truth, the economist accounts for it all, who explains to us the speedy recuperation of cities, laid in ruin by good, fire, and earthquake. During its years of trial, Mormon labor had subsisted on insufficient capital, and under many dif­ficulties; but it has subsisted, and survives them now, as intelligent and powerful as ever it was at Nauvoo; with this difference, that it has in the meantime been educated to habits of unmatched thrift, energy, and endurance, and has been transplanted to a situation where it is in every respect more productive. Moreover, during all the period of their journey, while some have gained by practice in handicraft, and the experience of repeated essays at their various halting-places, the minds of all have been busy framing de­signs and planning improvements they have since found opportunity to execute. Their territory is unequaled as a stock-raising country; the finest pastures of Lombardy are not more estimable than those on the east side of the Utah Lake and its tributary rivers; and it is scarcely less rich in timber and minerals than the most fortunate portions of the continent. From the first the Mormons have had little to do in Deseret, but attend to me­chanical and strictly agricultural pursuits. They have made several successful settle­ments: the farthest north is distant more than forty miles, and the farthest south, in a valley called the Sanpeech, two hundred, from that first formed. A duplicate of time Lake Tiberias empties its waters into the innocent Dead Sea of Deseret, by a fine river, which they have named the Western Jordan. It was on the right bank of this stream, on a rich table land, traversed by exhaustless waters falling from the high­lands, that the pioneers, corning out of the mountains in the night of the 24th of July, 1847, pitched their first camp in the Valley, and consecrated the ground. This spot proved the most favorable site for their chief settlement, and after exploring the whole country they founded on it their city named New Jerusalem. Its houses are diffused, to command as much as pos­sible the farms, which are laid out in wards or cantons, with a common fence to each. The farms in wheat already cover a space nearly as large as Rhode Island. The houses of New Jerusalem, or Great Salt Lake City, as it is commonly called, are distributed over an area nearly as great as that of New York. The foundations have been laid for a temple more vast and mag­nificent than that of Nauvoo. Indeed, the foundation of a mighty State is laid in the far West, having laws and institutions peculiar to the faith of its founders. Such has been the history of the Mor­mons in the past - their future is as yet unknown. But it needs not the eye of a seer to behold, through the dimness of that future, with some distinctness the dark form of contention. Among the applica­tions hereafter to he made of the long-asserted principle that an American citizen has the right to remove anywhere in our public domain with his family and his property, will be found some most momentous questions connected with the laws and institutions of Deseret. It is yet to be decided whether other Territories and States are bound to acknowledge and honor polygamy in the sons of Joseph Smith, and at the same time punish it most severely in the instance of others or, whether the door is to be thrown wide open to the most unbridled licentiousness. Christian philanthropists, it may be even at this early day, are bound to consider the propriety of pitching a tabernacle to Jehovah amid those distant tents of an impure religion which, like the handful of corn in the top of the mountain, may one day fill the whole land. The National Magazine. June 1854.